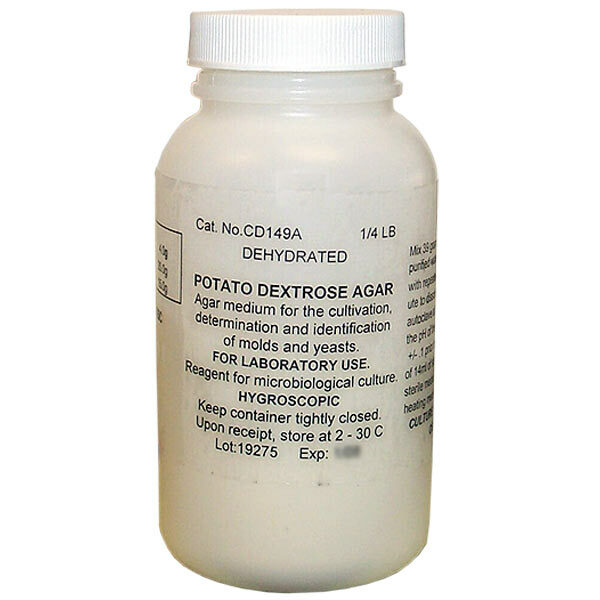 This dehydrated culture medium is ideal for cultivation and isolation of yeasts and molds from dairy products and other food products. Product supplied with Lot Number, Expiration Date, and procedure on how to prepare the agar medium. Suspend 39 grams in a clean beaker with 1000ml of cold, distilled water. This will yield 50 plates (15 x 100mm). Use 19.5 grams in 500ml of water for a 25 plate yield. Remove from heat. When agar has cooled to about 45°C (check temperature using a sterilized lab thermometer) it is ready to pour. Pour into sterile petri plates about 1/4” deep and allow to set. Once the prepared plates have gelled, they can be used or refrigerated for future use. 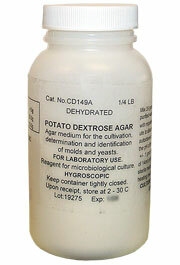 Store plates upside down with potato dextrose agar in upper half of plate. This will prevent condensation from dripping down and contaminating the agar growing surface.